APROBACIÓN DEFINITIVA DEL REGLAMENTO DE CONTRATACIONES LABORALES. CONVOCATORIA DE JUNTA GENERAL ORDINARIA PARA EL PRÓXIMO DÍA 27 DE AGOSTO. APROBACIÓN DEFINITIVA DEL PRESUPUESTO GENERAL PARA 2017. APROBACIÓN INICIAL DE LA ORDENANZA REGULADORA DE LA TASA POR TULICIACIÓN DE LOCAL EN C/ MADRID Nº 3 Y CENTRO MULTIUSOS EN PLAZA LA PAZ. APROBACIÓN DEFINITIVA DE LA CUENTA GENERAL DE 2016. APROBACIÓN DEFINITIVA MODIFICACIÓN ORDENANZA FISCAL REGULADORA DE LA TASA POR SUMINISTRO DE AGUA. 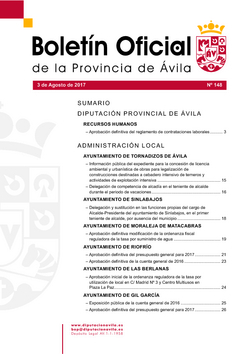 INFORMACIÓN PÚBLICA DEL EXPEDIENTE PARA LA CONCESIÓN LICENCIA AMBIENTAL Y URBANÍSTICA DE OBRAS PARA LEGALIZACIÓN DE CONSTRUCCIONES DESTINADAS A CEBADERO INTENSIVO DE TERNEROS Y ACTIVIDAD DE EXPLOTACIÓN INTENSIVA.